Biodynamic Beekeepings with Gunther and Vivian of http://spikenardfarm.org has been the highlight of the past decade of my training. I learned so much being with them and all my classmates in their Two Year Sustainable Biodynamic Beekeeping Trainings course. I continue to learn from all the beekeepers that I participated with and we return each year to the sanctuary for advanced topics and to volunteer for projects. My introduction into natural beekeeping started in 2009, when I was homeschooling my children and wanted to personally learn more about bees and consider keeping them at our small permaculture homestead in Takoma Park, MD. 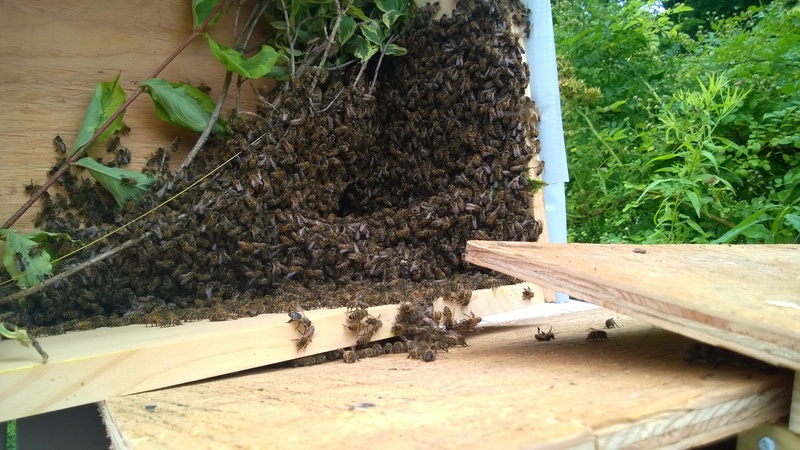 It’s a challenging place to keep bees because it’s so urban and there are many hives around the area and there is always a severe shortage of nectar every summer. My first year it was obvious that feeding was going to be heavy and necessary to keep the hive alive, I just had a really hard time feeling good about this somewhat invasive, unnatural requirement to keep bees. This first hive of mine did not make it through the winter and I decided I needed to wait to continue this hands on experience in a more suitable area once we moved out of Takoma Park, MD. As of August 2017 in Ghent, I have Lang Hives (3 of them) curtesy of http://www.hudsonvalleybeesupply.com a great local resource and the only one I’ve found so far in this area serving the Beekeeping Community. Once we bought land to begin the farm I invested in three Lang hives (mediums as a local beekeeper suggested). I also purchased my first WARRE hive from here: http://www.thewarrestore.com/warrehives.htm and I purchased Black Locust plank boards to eventually start building my own Warre Hives when my Apiary takes off. I’m currently in an ideal location for an Apiary, I’m surrounded by hundreds of fallow acres, for better or worse in the big picture of agriculture but for the bees it’s heaven. The forage here is available from sometime in March through October (Witchhazel forest!). Since 2014 on this property I have struggled to have enough hives survive the winter to build up my apiary. I currently have 3 Langs and 1 Warre but I had to rebuild this from two packages I purchased in March and May of 2017 since all four of my hives didn’t make it through the winter. I’ve joined a local beekeeping group to continue to expand my regional beekeeping knowledge and learn from the elders in this community. I’m particularly concerned with Varroa and the drastic temperature changes we have been experiencing during the winters.